For Easter Egg Dot the Alphabet, and Easter Egg Dot the Alphabet. 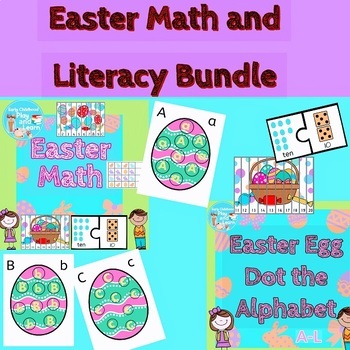 For Easter Math, the packet includes two number line puzzles, Easter patterns, and Easter egg number puzzles. For Easter Egg Dot the Alphabet, do-A-Dot letters A – L are provided in both upper case and lower case. Give the children two different colors of daubers or dot markers. Let the children dot the lower case letters with one color and the upper case letters with another color.